The recent decision by Colombia to impose extended producer responsibility (EPR) for post-consumer pesticide packaging reminded me of a draft sitting in the infamous backlog queue since January. It looks at the Brazilian system for dealing with such packaging, which seems to be operating very well, in spite of predictions to the contrary by skeptics several years ago. Perhaps there are lessons from the Brazilian experience Colombia and others can profit from. The question is, are there any serious attempts among these countries to conduct regular interchange of experience on the subject. Meet Olimpio. This scarecrow is the spokesman for the advertising and education campaign for one of the world’s most effective programs at recovering and ensuring proper treatment, recycling or disposal of post-consumer pesticide packaging. Olimpio speaks Portuguese. You see, the program’s in Brazil. Yes, Brazil. Brazil’s National Institute for Processing Empty Packaging (Instituto Nacional de Processamento de Embalagens Vazias – InpEV) reports that as of end-2006, 63% of all packaging and 88% of the primary packaging for “agro-toxics” (primary pesticides) were being recovered, receiving proper handling and “rumo certo” — proper treatment (usually triple washing) and either recycling or incineration. These high percentages were reached even as Brazil posted a 10% increase in volume recovered, from 17,881 metric tons (mT) in 2005 to 19,634 mT in 2006. InpEV claims that this recovery rate put them in first place among the 30-some organized national programs tracked worldwide by CropLife International, the international trade association for what the industry prefers to call “plant protection products.” Whether or not they actually have reached top spot, I have not been able to confirm, but I do know it is far and away the best in LAC and higher than France (43%), Germany (55%) and the US (20%). I tend to doubt that they have topped Belgium and the Netherlands, though, who have had return rates in the 90’s in recent years. But even so, to be among the top five worldwide after five years of a formal program is extraordinary. The top collecting Brazilian state is the center-west agricultural power, Mato Grosso (MT), at 4,555 mT in 2006 (23.2% of the national total). MT is the leader in part because the Inpev program focused there first. Second was the southern state of Paraná (PR), at 5,757 mT (19.1%), followed by São Paulo (SP) at 2,905 mT (14.8%). The greatest growth over 2005 came in small northeastern Piauí (PI), up by 182.7% (2005 was the first full year for PI), followed by eastern coastal state Espírito Santo (ES) at 105.9%. New to the collection system in 2006 were Rio de Janeiro (RJ) at only 9.5 mT, and Rio Grande do Norte (RN) at 18 mT. 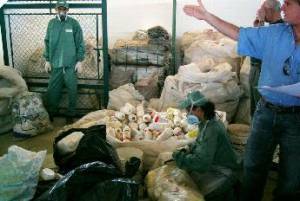 The only states not yet in the program in 2006 were Acre (AC), Amazonas (AM), Pará (PA) and Sergipe (SE). What Happens with the Collected Material? In 2006 some 81% of the collected packaging was plastic — primarily PET or HDPE (or perhaps Coex) for main packaging, polypropylene for caps — and InpEV says that 95% of it is recycled, while 5% (mostly contaminated plastic that cannot be sufficiently cleaned) is incinerated at industry incinerators (such as BASF) with hazardous waste permits. What products are made using the plastic sourced from used pesticide packaging? You might be surprised. It includes motor oil containers, insulation for electrical cables, casings for car batteries, plastic rope, sacks for hospital wastes, electric junction boxes, sewage tubing, caps for pesticide containers, and large waste containers. Around 3.1 mT pesticide packaging material collected is paper/board, and about 2 mT from metal (steel, aluminum and tinplate), and these are recycled into products like steel beams and large paperboard trash bins. Why is the Brazilian System Working? 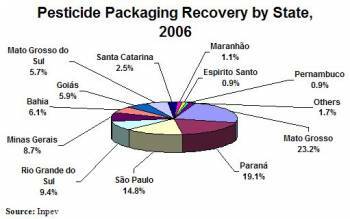 Pesticide packaging return programs existed in Brazil prior to the 2000 law, but participation was low. But just as important as the new law’s mandate to producers/vendors is the mandate to collaborate with the government. The two in fact do work together, and that has helped make the program a success. 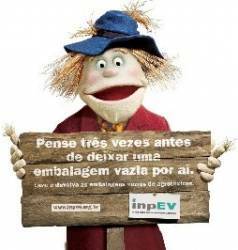 Other contributing factors that can be identified include (1) the steady educational effort by InpEV in print, radio and television (featuring Olimpio), with concentrated campaigns during seasons when pesticides are applied the most; (2) InpEV started with a limited, sharp regional focus on the states with the biggest pesticide consumption, building momentum while expanding geographic coverage gradually; (3) InpEV early on sought out recycling allies to take the collected materials, such as the trade association representing the PET industry in Brazil, Abipet.